This exceptionally beautiful statue, cast in fine bras, represents Lord Krishna playing enrapt on his flute. 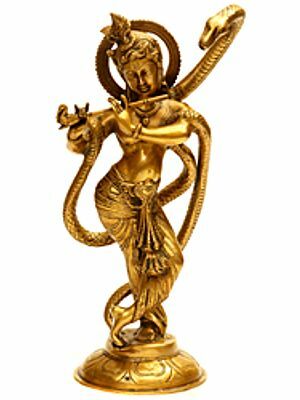 Outstanding in modeling, plasticity, artistic merit and worth, visual effect and figural balance the statue blends the best of different art-traditions for reaching such level of excellence. The image pursues South Indian norms of iconography of the figure conceiving the image of Krishna like that of Vishnu with alike stately grandeur and majesty : the towering crown, mark of Vaishnava ‘tilaka’ on the forehead, ‘prabha’ – halo, typical facial features, moderate figure-height, among others, and those of metal casting prevalent in South Indian art, but the perceptible emotionality with which his image has been treated, especially as it reveals in its ‘tri-bhang’ posture, and the ‘bhava’ – bearing, on the face, are the elements of Krishna’s ‘lila-rupa’ – divine sport, the characteristic features of north Indian art. The ‘bhava’ that this image reveals sublimates the mind transcending it to spiritual heights. The gentle, dteached smile that floats on the image’s lips manifests the rapture within, and beauty, auspiciousness and good without. The image inherits the aura of transcendence from the Krishna’s entire worship cult, a path of love and redemption from the material world by being its very part : ties being the tool of redeeming from ties. 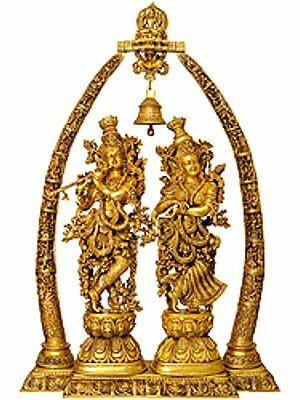 As for its exceptional ornamental character, the image seems to borrow it from Halebid sculptures in Karnataka. The artist has used an abundance of decorative frills all over the figure curling like floral and vine arabesques emitting from every zone of the image, from ornaments and costume, mainly those flanking the face from behind looking like components of headgear or ear-ornaments, stretching and clinging to shoulders and trailing further down across the arms, those attached to arm and wrist bands, some more elaborate pieces to waist-band and girdle, and a few to the ‘patta’ – decorative component of the ‘antariya’ attached to it for beauty in the centre of ‘antariya’ between the two legs. Not exactly, Krishna manifests in his ‘tri-bhang’ posture 'lasya' – a mode of dance that defines love, beauty, creation and aesthetic delight, broadly all aesthetic aspects that reveal in an accomplished dance. Scholars have discovered in three curves of his figure or rather in any three numbers related to it a cosmic mystique. An incarnation of Vishnu, all three worlds are Krishna’s magnification and are at his command, a theory that acknowledges him as Jagannatha, the Lord of the universe. He controls entire cosmic course : creation, sustenance and dissolution. Those advocating this theory perceive three curves of his figure as pervading the three worlds that comprise the cosmos. The image manifests other repeats of this analogy of three numbers. His headdress comprises three components : 'prabha' – circular disc on its back, crowning element on the forehead, and a towering apex which itself elevates into three steps, and further, in three rings that the ‘prabha’ has, three folds of neck, the form of girdle, and so on. As overwhelmed by divine melody pouring from his flute, the entire image appears to burst into divine rapture. The bliss with which the face glows is the most outstanding feature of the iconography of the image. Strangely, it discovers its excellence in bold details but in their exceptionally sensitive treatment. Sharp nose, emotionally charged eyes, well-defined chin and lips with a smile floating on them are the features of the figure's iconography. Triply folded neck naturally aligns between the face and the torso. Good figure height, recessed belly, long and pointed fingers and beautifully curling hair falling on the back define the anatomy of the figure. He is clad in a well-pleated 'antariya’ supported by a waist-band and beautified by a decorative central stripe, and two ‘patakas’ – decorative large scarves, designed like frills and attached to the girdle unfurling on the right and the left. The figure is enormously ornamented from head to toe and even the back of the hand has a traditional ornament rarely seen adorning a figure. Most delightfully, there perches on his left shoulder a tiny form of a peacock. Besides its long tail it has beautiful wings.